Any gun his business has will fall into one of three categories: gunsmithing, retail, or manufactured. Gunsmithing guns are guns that someone is essentially loaning to him and asking him to do some kind of modification to. These guns will generally come in and go back out to the same person. Retail guns are guns he has purchased from another person or entity with the intent to sell to a different person. Finally, manufactured guns are guns that he has made himself with the intent to sell. This gunsmith database should handle and track guns from any of these categories. The United States takes gun tracking seriously. They have defined regulations for keeping electronic records for firearm acquisition and disposition. An electronic system must comply with these regulations, which means a person from the government much check the system to make sure it meets all of their regulations. Obviously, my primary goal must be to meet all government requirements. These are laid out in ATF Ruling 2013-5 but in general the requirements are that within 15 days of acquisition, the type, model, caliber/gauge, manufacturer, country of manufacture, name and address of other person in the transaction, and the serial number must be recorded. Additionally, my friend has a few requirements of his own. He would like the system to be searchable and sortable, it should also have the ability to generate custom reports. He would also like the ability for the system to send him an email on a defined scheduled that lets him know which guns are late or which orders are still open. Other things he would like to track are deadline, category (gunsmithing, retail, manufacturered), purchase price, and date entered. Finally, I have requirements of my own. Where possible, the GUI needs to use dropdown menus to prevent incorrect data being entered. In addition, some fields will need to be required before the GUI allows the data to be submitted. I’m sure more requirements will come as the project gets further along, but this should do for a starting point. Below is a sketch of what the schema should look like. Green items are required by the ATF ruling and red are not. Below is my rough draft GUI. It has more text boxes than the final have, but overall I envision the final GUI to look very similar to this one. 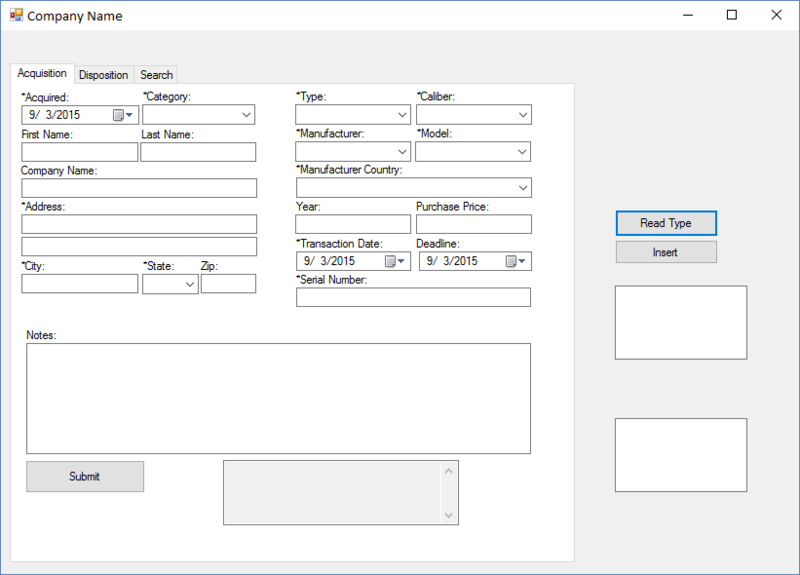 The dropdown menus in this GUI are populated from tables in the database. In this way, no data is hardcoded into the GUI. This looks as though it is set up correctly, following the schema I had laid out. I checked each of the tables, and they all seemed to be OK. I don’t particularly care for the data in most of these tables because it is just filler data. Once I get each of these three things finished, I can send the application off to my friend. He won’t be able to use it solely, but I would like for him to start using it in conjunction with his current method so that we can both see what works and what doesn’t. While he is using it, I will continue to add features he has requested (such as the reporting). That’s it for the overview! The next several parts in this series will go further in depth on how I designed the system and my thought processes behind different decisions along the way. Check out Part 2: Adding Customers.